The Metro Board of Directors will meet at 10 a.m. on Monday, April 30, at Metro headquarters to consider a contract to purchase new light rail vehicles. The Board’s regular monthly meeting is at 9 a.m. on Thursday, April 26, also at Metro HQ. That meeting already has a couple big issues on the agenda — namely consideration of the Final Environmental Impact Statement/Report for the Westside Subway Extension and the Regional Connector. 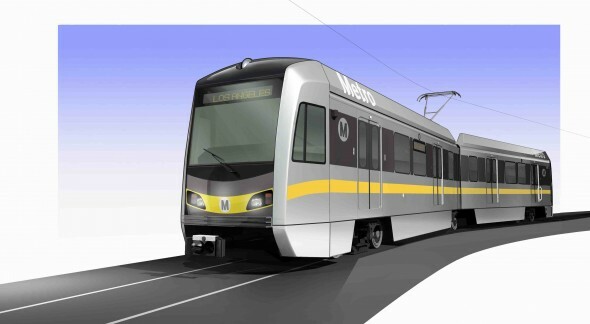 Metro staff have recommended a $299-million contract with Kinkisharyo International, LLC, for the purchase of 72 new rail cars, along with four options for the purchase of an additional 157 light rail cars for $591 million. After protests from other light rail car manufacturers, the Metro Board decided in March to postpone their vote for one month. Here’s an earlier post on The Source with more renderings and information about the new rail cars. If these trains are anything like the Type 7s in Boston, consider it money well-spent. The T hasn’t been able to overhaul them in 25 years, and they’re still going strong. Will this be the new livery for Metro Rail? The yellow striping seems like a new addition.